The largest retail chains in Mexico are also some of the largest retailers in the world, according to the Global Powers of Retailing, an international revenue ranking list compiled by Deloitte Touche Tohmatsu each year. It's not surprising considering the Mexican economy is the 15th largest in the world as of January 2017 and will be poised to jump to 12th place, according to the CIA Factbook's 2017 estimates. Overall, the Mexican retail industry has fared well compared to its global competitors. Looking at a comparison between the 2013 and 2016 rankings of the largest retail chains in Mexico, almost every company on the list has improved its position. Positions are determined by comparing annual revenue figures for all types of retail chains from all countries. About two-thirds of retail sales in Mexico take place inside grocery stores and supermarket chains, so it's not surprising that most of Mexico's largest retail chains are hypermarkets and convenience stores that sell food. FEMSA was the Mexican retail chain with the biggest rise in the global retail rankings in Deloitte's report between 2013 and 2016, rising from 156th to 100th place in 2013 and 2016 respectively. Founded in 1977, FEMSA operates under the OXXO brand name, with locations all across Latin America. Here's a list of the largest Mexican retail chains, according to the Global Powers of Retailing 2016 Report. The list is arranged according to the ranking number assigned to each Mexican retailer, along with its previous ranking three years earlier. Each company's retail revenue is also listed for each year. Mexico had a population of 129.2 million people in 2017, with an economy worth $1.15 trillion USD economy. The Mexican economy is Latin America's second-largest economy. An estimated $490 billion USD of that was in retail sales, including $4.2 billion from retail internet sales. According to estimates, Reuters reported Mexico's online retail industry would be worth $7 billion by the end of 2018. That figure was nearly double before a new trade deal was struck between Mexico and the U.S. to replace NAFTA. Grocery sales account for two-thirds of the total annual retail industry sales in Mexico, according to Euromonitor International. More than 70 percent of the population is considered to be comprised of "high" and "middle" class shoppers who have access to bank and retail credit cards, according to ANTAD. As with most retail industry sectors in most countries, the fastest growing retail channel in Mexico is internet retailing. Contributing to that growth was the expansion of Amazon product offerings in 2015, which previously was previously limited to the sales of e-books and e-reader devices. As of 2018, Amazon began to offer non-perishable food items such as tea, coffee, liquors, wines and beers, along with cooking ingredients and snacks. The largest retail chain doing business in Mexico is Walmart México y Centroamérica (also known as Walmex), which is, of course, part of the largest retail chain in the world. Walmart is based in the U.S., so it is included on the largest U.S. retail chains list but not on the largest Mexican retailers list. Despite the size of the Walmart chain in Mexico, here is proof once again that there's no such thing as being "too big to fail." It was clear when Walmart put its Suburbia clothing chain in Mexico up for sale in 2016. The reputation of Walmart was damaged with both Mexican and American consumers in 2012 after it was revealed that the U.S. retailing giant had allegedly been involved in the bribery of Mexican government officials. There is not a single senior level Mexican or U.S. Walmart executive who was allegedly involved in the Walmart Mexican Bribery Scandal who is still working for the company today. 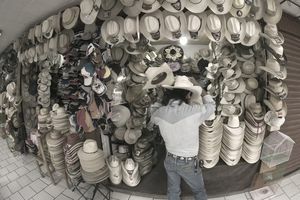 Mexican retailers get plenty of direct competition in their own country from U.S. retail chains. Costco, Victoria’s Secret, Starbucks, Burger King, McDonald’s, Tasti Dlite, Cold Stone Creamery, Wendy’s, YUM Brands and Baskin-Robbins are some other U.S. retail chains doing business in Mexico.